**THIS NEW FEATURE IS COMING SOON! The Lease Applications screen allows you to specify what activities should occur within Broker Brain when a Lease Application is accepted or withdrawn. 1. From the Admin tab, click the Site Settings sub tab on the left-hand side of the screen. Click the Lease Applications sub tab (at right). 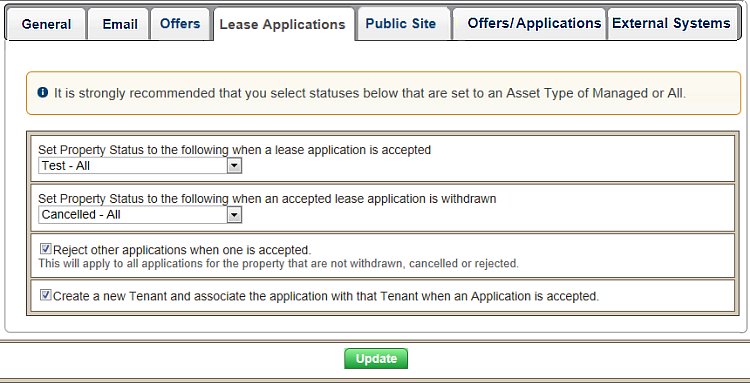 Set Property Status to the following when a lease application is accepted - Using this field, you can tell the system to change the property status when a lease application is accepted. Indicate the desired status using the drop-down arrow. Note: It is strongly recommended that you select a status whose Asset Type is set to Managed or All. Set Property Status to the following when an accepted lease application is withdrawn - This field allows you to specify the status a property should be set to if a lease application has been submitted and is subsequently withdrawn. Note: It is strongly recommended that you select a status whose Asset Type is set to Managed or All. Reject other applications when one is accepted - When this checkbox is enabled, any time a lease application is accepted on a property, all other applications on that property that do not bear a status of withdrawn, cancelled, or rejected will be automatically set to a status of rejected. Create a new Tenant and associate the application with that Tenant when an Application is accepted - Once enabled, this checkbox will save you a step within the system by automatically creating a new tenant when a lease application is accepted. In addition to creating the tenant, the system creates a link between the tenant and their lease application. By default this check box is not enabled, so if you wish to take advantage of this feature, be sure to turn it on.